With Microsoft’s new windows 8.1 update , now you can directly boot to your desktop instead of the start screen . Apart from this windows 8.1 introduces many user friendly changes for windows 8 users . Here is how you can set windows 8.1 to boot straight to the desktop . For those who have not updated to windows 8.1 . The windows 8.1 update is available as a free upgrade for all windows 8.1 users from the windows app store . Alternatively if you are using windows xp , windows 7 or windows vista then you will have to perform a clean windows 8.1 installation . you can also follow our how to guide to create a bootable windows 8.1 USB flash drive and install windows 8.1 on your windows 7 computer . Continue reading to find out how you can set windows 8.1 to boot directly to the desktop . 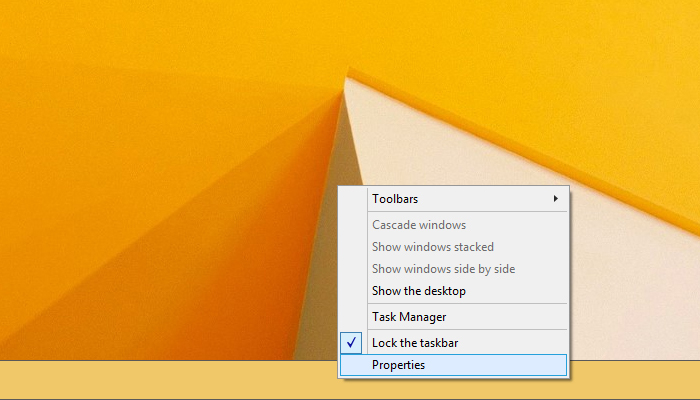 Step 1: On your windows 8.1 desktop , right click on the taskbar and select properties . 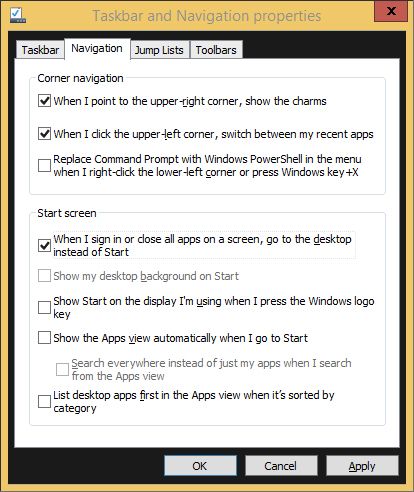 Step 2: From the taskbar and navigation properties window that opens up , select the navigation tab . Step 3: Under start screen , check the “When I sign in or close all apps on a screen, go to the desktop instead of Start” and click ok to save the settings . Thats it , now when you restart windows 8.1 , you will be taken directly to the windows desktop instead of the start screen .